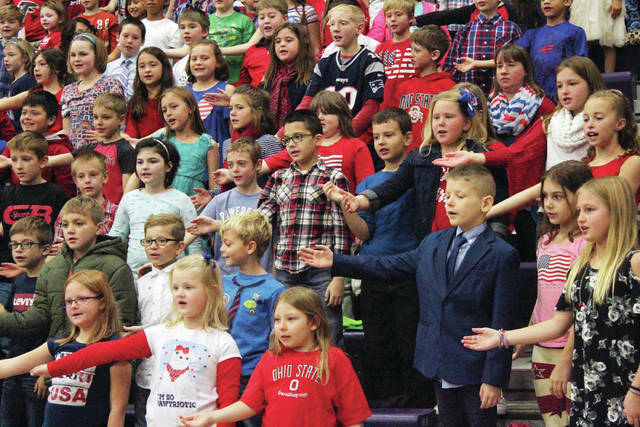 Swanton Elementary School students sing “Heart of America” during the Veterans Day program on Friday. 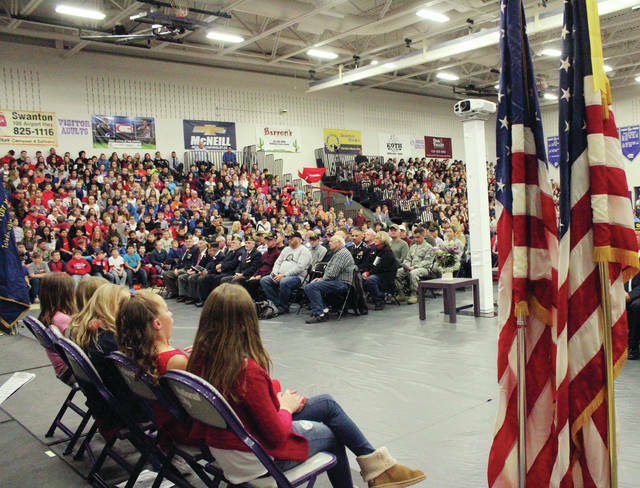 Chief Master Sergeant Joseph W. Dempsey was the guest speaker at the Swanton Veterans Day program. 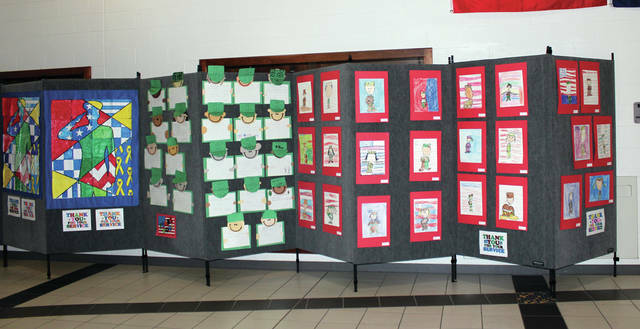 Veterans Day art created by Swanton students was on display in the hall outside of the gymnasium on Friday. 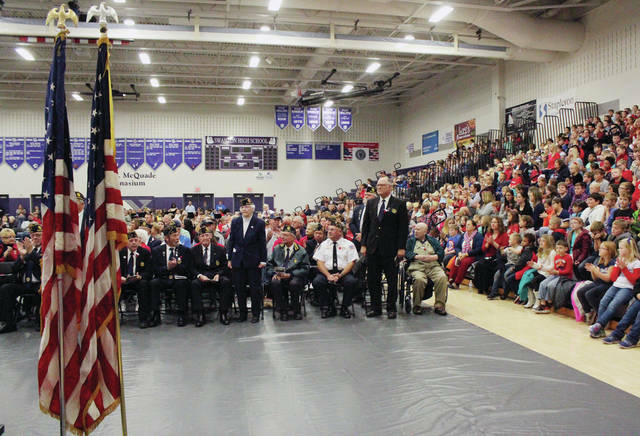 The annual Veterans Day program was held Friday at Swanton High School. 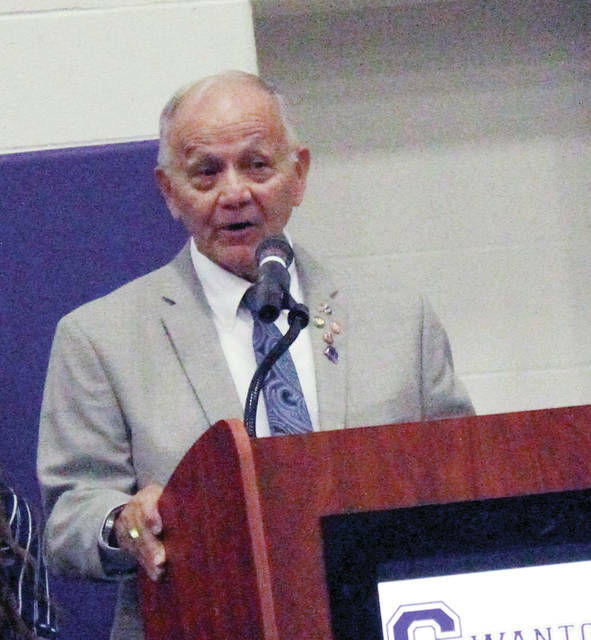 Poems read by children, guest speaker Chief Master Sergeant Joseph W. Dempsey, and a video presentation were among the highlights of the event. This year, Veterans Day marked 100 years since the end of World War I. In conjunction with that anniversary, the Spirit of the American Doughboy statue at Memorial Park in Swanton was recognized. The World War One Centennial Commission and the Pritzker Military Museum and Library, in partnership with The American Legion and Veterans of Foreign Wars, designated the statue in Memorial Park a WWI Centennial Memorial. The memorials are in 28 different states, and each received $2,000 matching grant funds towards their restoration and maintenance through 100 Cities/100 Memorials. The 100 Cities/100 Memorials was created to help draw attention to WWI memorials across the United States. and enables all of America to take part in the WWI Centennial Commemoration. The profound impact of the war moved citizens in places across the United States to commemorate both the national and local sacrifices from the conflict through monuments, buildings, plaques, parks, groves, roads and highways. Many of these WWI memorials have deteriorated due to the ravages of time, exposure to the elements, neglect, and even vandalism. The funds will be used to conserve, restore or improve these memorials. More importantly, the program is designed to raise community awareness of those who served, and provides a tangible connection to the profound impact this war had on local towns and cities, securing an important place in military history. The statue in Swanton is known to be one of E.M. Viquesney’s first statues, she added. Swanton’s Doughboy was dedicated on July 5, 1926.